In April 2016 the First Asia-Pacific Urban Forestry Meeting took place! Missed it? No reason to worry – find out all about it in this new blog by Dr. Andrej Verlič, head of the EFUF 2016 organizing committee. The First Asia-Pacific Urban Forestry Meeting took place between April 6 and 8, 2016 in Zhuhai, China. It was hosted by FAO, the Urban Forestry Research Centre of the State Forestry Administration of the People’s Republic of China, and the City of Zhuhai. It was a major event, attended by about 200 delegates from 17 Asian countries, Europe and North America, who represented around 60 government institutions, NGOs, universities, international organizations and professional associations. The meeting explored the role of urban forestry in helping to achieve the Sustainable Development Goals. Representatives from various region countries shared their experiences, case studies and information on the status of urban forestry in their homelands. 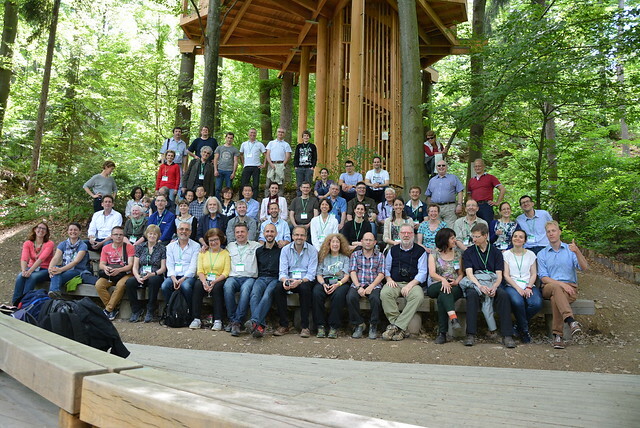 Divided into five working groups, delegates on the last day examined the role of urban forestry in health and wellbeing, cultural heritage, green economy, urban planning and provision of ecosystems services. The meeting ended with a round table, where the main challenges for development and inclusion of urban forestry in the region were discussed: knowledge sharing, capacity building, education & research, awareness raising, advocacy and funding sources. On the last day of the meeting, the Zhuhai declaration was unanimously adopted. The declaration is submitting eight recommendations for consideration and awareness raising, by which delegates are conveying their willingness to work together with policy- and decision makers, practitioners and other stakeholders. The declaration is sending a message to national and local governments, international organizations, funding agencies, universities and research institutions, NGOs, civil society, urban forestry specialists and practitioners, urban planners, private sector and local communities, expressing delegates’ concerns, calling for action, proposing solutions and reaffirming delegates’ belief that forests and trees in and around cities are the key element to make cities in the Asia-Pacific region greener, healthier, happier and more resilient to climate change. Hopefully, the message of the First Asia-Pacific Urban Forestry Meeting will get across. Across European cities, citizens nowadays play a prominent role in the management of public green spaces, but what does this mean for authorities? Find out more in this blog by Thomas Mattijssen, research fellow at the Wageningen University. While urban green spaces were traditionally developed and managed by authorities in most of the 20th century, my research and that of many colleagues highlights a stronger involvement of citizens in recent times. Many local authorities struggle with budget cuts and scarce resources for green space management. This is the reason that policy makers and public officials often tend to look somewhat hopefully at citizens and their activities regarding green space. Expectations are high in many countries, whether we talk about ‘localism’ in the UK, ‘participation society’ in the Netherlands, or look at the policy documents of the European Union. Citizens are expected to be active citizens that take responsibility for their personal living environment. Many bottom-up initiatives considering urban green space show that citizens can indeed be active citizens – they have proven to be knowledgeable and capable of managing varying types of green space. As research experiences across Europe show, efforts by citizens can lead to positive outcomes and are sometimes celebrated as a success by authorities. However, my own research findings suggest that the majority of citizen green space initiatives are relatively small-scale compared to ‘traditional’ management. Our bias to focus on successes and good practices tends to overlook other examples where citizens are less successful. In this time of budget cuts, we should reflect on expectations placed on citizens. Cutting budgets for green spaces and simply expecting citizens to take over will usually not work. Although citizens can certainly contribute to the management of public green spaces in urban settings, there is a danger of ‘instrumentalizing’ citizens – expecting them to achieve policy objectives of authorities. Citizens are not always interested in being involved in green space management, nor always equipped to implement it, and they might have different objectives than the authorities. I believe that rather than instrumentalizing citizens, we should try to look more from their point of view. Instead of trying to enlist citizens in the management of green space, authorities and other parties involved in its management would do well to start with looking at existing grassroots initiatives. Albeit small scale, some existing initiatives can realize important social and environmental effects with relatively little resources. Yet, current research shows that many local green initiatives struggle with collecting resources and often receive relatively little support from authorities. I believe that a little investment from authorities in supporting such groups can potentially realize important local effects with relatively little means. With this blog post, I plead to see citizens’ green space initiatives as a local addition to management, rather than as a replacement. Authorities cannot just expect citizens to take over, however, they can probably benefit from the existing energy that citizens invest in the development and management of urban green space. This blog post is authored by Thomas Mattijssen and is a part of the #EFUF2016 blog competition. Featured photo by East Hudson. How safe are urban forests? Urban forests and green spaces should be safe and calm places. But is this really so? Read more in this blog post by Ana Simčič, a forestry engineer from Slovenia. Cities that are surrounded by forests and have more green areas provide more quality lifestyle for their citizens. Recreation in urban forests and other green areas is one of the most appreciated and desired forest services in urban area. Jogging, walking or just hanging out with friends in urban forests is popular spending of free time during afternoons and weekends. But where more people gather, it is more likely that there will be undesired impacts left. Unfortunately, those impacts are sometimes consequences of violence that is called vandalism. It is an action involving deliberate destruction or damaging public or private property. It is a common phenomenon in public places in cities but apparently it is also inevitable in urban forests. In most cases things that are attacked by vandals are sign boards, picnic places with benches and tables, bins and also plants. But it becomes scary when vandals decide to damage trees. My aunt once said that she is afraid of forests, because they are dark quiet places, where you can run into strange people. I thought it was so funny and was thinking that forests are probably more afraid of us than we are afraid of them. And this is not that funny anymore. Forests can live without us, but we can’t live without them. So why should they be afraid of us? Vandalism is common in public areas during night or in places that are not so crowded during the day. The widespread popularity of outdoor team sports in green spaces offers many opportunities to improve health and fitness, build strong community links with young people, burn off excess energy, develop a sense of pride in physical skills and ability. It is a key element in the reduction of juvenile crime and vandalism. But still, urban forests are usually quiet, shaded and cover big areas so vandals have many locations to hide and do the damage. Unfortunately, trees are defenseless and can be an easy target for vandals. Whether the damage is caused by someone who is deliberately trying to kill a tree, or by lovers or taggers carving their initials into the bark, the end result is the same. Sensitive layers of tissue lie just under the bark of a tree. This area should be protected from wounding, since wounded tissue provide an opening for pathogens and result in tree diseases. Fear of crime. Crime, the fear of crime, disorder and anti-social behavior in green spaces are some of the things that worry people and discourage them from using those spaces for relaxation and recreation. Investors are discouraged from the investments in new infrastructure if there are problems with vandalism or if there are abandoned areas nearby. Urgent replacement costs of broken items. Ruined aesthetics of landscape. Damaged items will give us a feeling of abandoned and dangerous place. Vandal behavior of just a few offenders may affect all visitors in urban forests and other green spaces. We all want to enjoy nature to release our everyday worries. When we come to forests our worries should be gone and not feeling even more stressed because of damaged surroundings and injured trees. This blog post is authored by Ana Simčič and is a part of the #EFUF2016 blog competition.